↑ BirdLife International (2009). "Pavo cristatus". IUCN Red List of Threatened Species. Version 2009.2. International Union for Conservation of Nature. Retrieved 2010-02-15. ↑ "Common (Indian) Peafowl". Rolling Hills Wildlife Adventure. Retrieved 26 December 2012. ↑ Ali, S; Ripley, S D (1980). Handbook of the birds of India and Pakistan. 2 (2nd ed.). Oxford University Press. pp. 123–126. ISBN 0-19-562063-1. ↑ Johnsingh, AJT; Murali, S (1978). 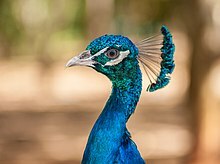 "The ecology and behaviour of the Indian Peafowl (Pavo cristatus) Linn. of Injar". J. Bombay Nat. Hist. Soc. 75 (4): 1069–1079. ↑ Whistler, Hugh (1949). Popular handbook of Indian birds (4th ed.). Gurney and Jackson, London. pp. 401–410. ISBN 1-4067-4576-6. Peafowl videos, photos & sounds on the Internet Bird Collection. Behavioural Ecologists Elucidated How Peahens Choose Their Mates, And Why, an article at Science Daily.